This camp – an annual event since 1992 – rotates location among the communities of Ursy (Mifroma headquarters), Estavayer-le-Lac (Estavayer Lait SA) and a third locality that is different each time. In a friendly atmosphere that’s built around working towards a good cause, these green weeks are intended to develop a sense of cohesion among the dairy company’s next generation. The apprentices were unanimous in their positive reaction to the benefits of such an initiative – which is particularly important in a large multi-site organization like ELSA-Mifroma. They also simply appreciated this break with daily routine. This year, green week took place from July 10th to 14th. 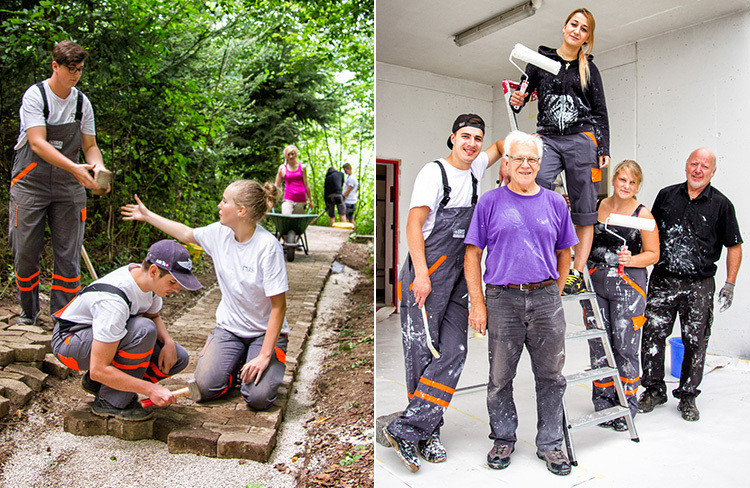 The 21 apprentices from throughout the group’s sectors of activity were split into three teams to work together on infrastructure projects around the municipality of Ursy (FR). The results? Revamping of a bus shelter, a pedestrian trail, and a civil protection shelter. Throughout the camp, there are no divisions – not between girls and boys, not between apprentices in administration or logistics. All are equal when it comes to this work. During this green week the apprentices were housed in a rural lodging in a neighboring village. “The ambiance was excellent. In general, the young people were so tired out from their day that we didn’t have to push for them to go to bed,” remarked Patrick Freymond. In parallel to these very full days, the group also enjoyed some fun activities during the week, including barbeques, karting and paintball outings. Company leadership and municipal authorities were also in attendance for an official evening event to visit the worksites and share a dinner.